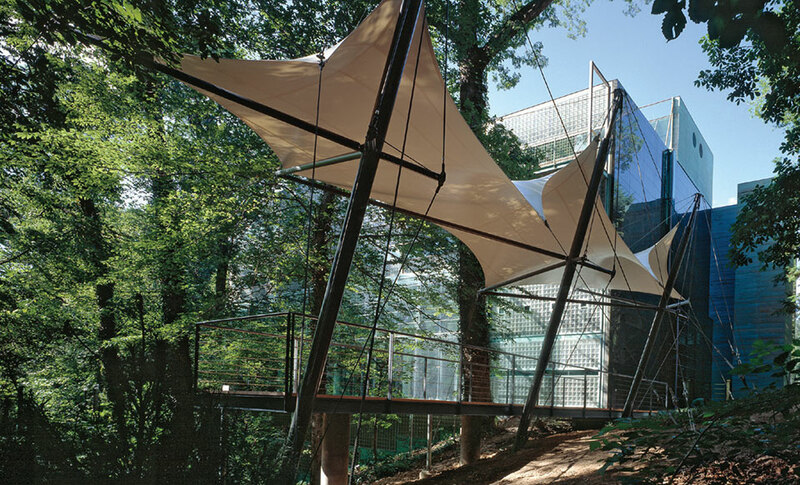 The Finnish embassy in Washington, D.C., is a green building that was ahead of its time. Here is the story of this sustainability pioneer. Many diplomatic missions around the world are concerned about energy efficiency today, but what does it mean for one to “go green”? 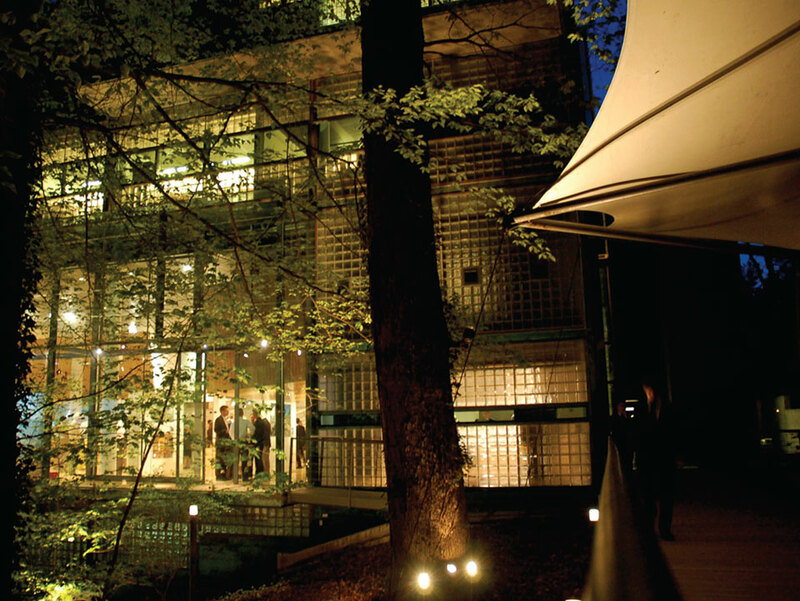 As the first diplomatic mission in Washington, D.C., to gain the prestigious U.S. Green Building Council’s Leadership in Energy and Environmental Design certification, in 2010, the Embassy of Finland prides itself as a leader in the field of sustainability. Taking its cue from a culture embedded in a love for the wilderness, Finnish architecture has a history of simple design that exists harmoniously with its natural surroundings. When architects Mikko Heikkinen and Markku Komonen were designing the new embassy building in the early 1990s, they chose to draw on this tradition. Much of the architecture’s effectiveness derives from subtle integration of the building and the landscape. 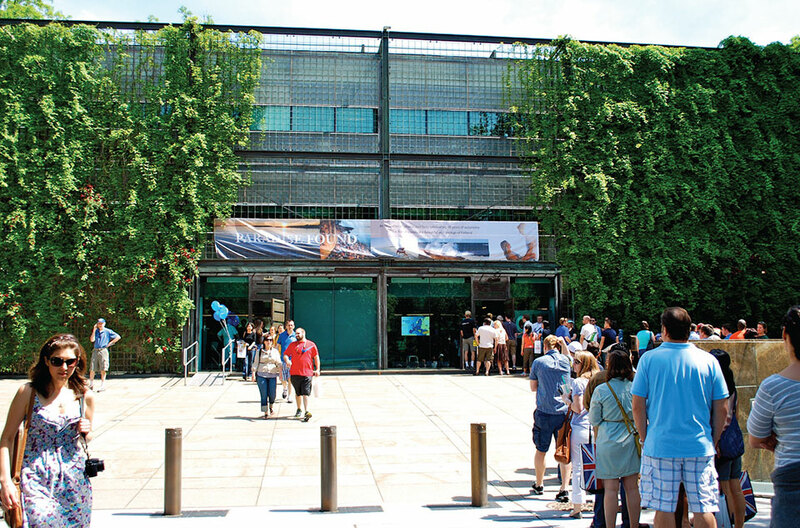 Wrapped in a grid of copper sunscreens (and seasonally wrapped in greenery), the building instantly established a powerful and progressive presence for Finland in Washington, D.C., on its completion in 1994. Two decades ago, issues of energy efficiency were not as widely considered as they are today. However, by favoring local materials and maximizing the use of natural daylight inside the building, the two architects managed to develop a green building that was ahead of its time. The annual European Union Open House day attracts approximately 3,000 people to the Embassy of Finland in Washington, D.C.. In subsequent years, finding ways to decrease the building’s environmental impact became a priority, reflecting Finland’s commitment to environmental sustainability. Transforming the embassy into a state-of-the-art green building thus seemed natural. As a first step, the embassy’s staff assessed the building’s energy consumption and discovered several ways to improve operations and maintenance in the process. The needs of the tenants were reviewed, and operating times were adjusted to correspond with actual use and occupancy, eliminating wasted energy when the building was unoccupied. Temperature settings were determined to moderate the use of the heating, ventilation and air conditioning systems. The introduction of a free-cooling system halved the use of electricity-powered cooling—a significant step in improving energy efficiency. The heating system was replaced with a modern one that gave consideration to the outside temperature’s effects on the building’s indoor environment to gain additional efficiencies. In addition, the embassy adopted more energy-efficient light bulbs and significantly increased the use of natural light. These measures drastically decreased the embassy’s energy consumption. Encouraged, the embassy staff decided to apply for the U.S. Environmental Protection Agency’s Energy Star, and received it in 2008. It was the first time a foreign embassy had earned this award in the United States. Wrapped in a grid of copper sunscreens, the building instantly established a powerful and progressive presence for Finland in Washington, D.C.
As a next step, the embassy staff began to investigate the U.S. Green Building Council’s Leadership in Energy and Environmental Design certification, the most prestigious, internationally recognized green building stamp of approval. LEED certification, they decided, would be the next goal of the building’s “greening” process. The LEED system rates buildings across several metrics: energy savings, water efficiency, CO2 emissions reduction, improved indoor environmental quality, and stewardship of resources and sensitivity to their impacts. The certification process involves rigorous building assessment practices, new policies and copious amounts of documentation concerning building operations and maintenance. As rigorous policies were implemented to encourage sustainable practices, the process had a direct impact on the building’s operations. Occupancy sensors were installed in offices, recycling became a major priority and purchases became subject to environmental considerations. The embassy donated used furniture and other durable goods to local schools and organizations, while toilets and faucets were fitted with water-saving devices that decreased consumption by 30 percent. Cleaning supplies were replaced with environmentally sound products, and low-impact chemicals were introduced into gardening and site maintenance. A stringent no-smoking policy was implemented, and garage space was redesigned to encourage cycling and the use of hybrid vehicles. The results speak for themselves. The building’s electricity use decreased by 50 percent and gas use by 65 percent. Compared to the average between 2002 and 2004, our embassy’s annual energy bills have decreased by $150,000. “Going green” is all about little steps and small, environmentally friendly actions. While energy efficiency has led to significant financial savings, this is only an indicator of progress toward the primary objective. The most important goal is to make the building as environmentally friendly as possible, and in that way increase the awareness of energy-efficiency issues among the visitors and the many organizations the embassy deals with each day. Our embassy in Washington is not alone in its greening efforts. Our counterpart mission, the U.S. embassy in Helsinki, opened a new Innovation Center in February 2013. This center is one of the most energy-efficient embassy buildings in the world, and it is the embassy’s primary location for meetings, information sharing and cultural programming. When Finnish President Sauli Niinistö spoke at the inauguration of the American Innovation Center, he observed: “Energy efficiency is the way of the future. Our countries are world leaders in developing smart technologies. I understand the Innovation Center is on track to receive the U.S. Green Building Council’s Leadership in Energy and Environmental Design, LEED Platinum certificate. This would make it the third building in Helsinki ever to achieve Platinum level, and the first-ever embassy building in the world [to do so]. This is a remarkable achievement. Energy efficiency is the way of the future. Our countries are world leaders in developing smart technologies. Acting on climate change is a top priority both in Finland and in America. The U.S. government is actively promoting green growth, while in Finland the government aims to develop the clean-tech sector into a $50 billion industry by 2020, creating as many as 40 000 new jobs along the way. Taking all this into consideration, it is only natural that the Finnish embassy in Washington, D.C., and the U.S. embassy in Helsinki make efforts to stay at the forefront in green building initiatives. “Going green” is all about little steps and small environmentally friendly actions. As the embassy of Finland celebrates its 20th jubilee, it is renewing its LEED certification and wishes to achieve even better results than the first time. However, a building’s green status doesn’t come from a certificate. It comes from its tenants—the people committed to living up to the environmental standards required for such a prestigious certification. As experience has shown, significant strides toward sustainability are very possible even in a relatively small organization such as the Finnish embassy. We therefore hope that other diplomatic missions, both in Washington, D.C., and around the world, will follow our lead. Emilia Honkasaari is the communications coordinator for the Embassy of Finland in Washington, D.C.